Anti-coup citizens express their silent protests with a symbolic gesture from the movies. 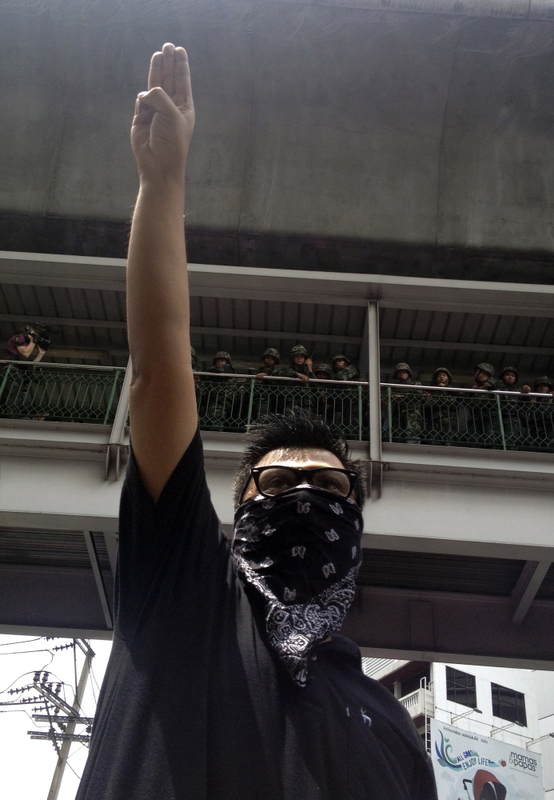 BANGKOK — The three-finger salute from the Hollywood movie “The Hunger Games” is being used as a real symbol of resistance in Thailand. Protesters against the military coup are flashing the gesture as a silent act of rebellion, and they’re being threatened with arrest if they ignore warnings to stop. Thailand’s military rulers said Tuesday they were monitoring the new form of opposition to the coup. Reporters witnessed the phenomenon and individuals were captured on film making the raised-arm salute. The Associated Press An anti-coup protester gives a three-finger salute as soldiers keep eyes on him from an elevated walkway near a rally site in central Bangkok on Sunday. Thailand’s military rulers say they are monitoring the new form of silent resistance to the coup. “Raising three fingers has become a symbol in calling for fundamental political rights,” said anti-coup activist Sombat Boonngam-anong on his Facebook page. He called on people to raise “3 fingers, 3 times a day” – at 9 a.m., 1 p.m. and 5 p.m. – in safe public places where no police or military are present. The gesture emerged over the weekend as protesters joined small flash mobs, or stood alone, flashing three fingers in the air. “We know it comes from the movie, and let’s say it represents resistance against the authorities,” Col. Weerachon Sukhondhapatipak, a spokesman for the junta, told The Associated Press. In “The Hunger Games” movie series and book trilogy, the salute symbolizes rebellion against totalitarian rule, signifying thanks, admiration and goodbye to a loved one. But Thai protesters gave varying explanations. Some cited the French Revolution’s trinity of values: liberty, equality, fraternity. Others said it means freedom, election and democracy. A photo montage circulating online paired a picture from “The Hunger Games” with a graphic of three fingers labeled, 1. No Coup, 2. Liberty, 3. Democracy. While the strife-imitating-art nature of the phenomenon is extraordinary, it’s not unprecedented. Other examples of pop culture symbols being used to express political sentiments include Occupy protesters wearing the Guy Fawkes mask from the “V for Vendetta” movie. “The Hunger Games” films have been popular in Thailand, but not unusually so. The last film, “The Hunger Games: Catching Fire” made $3.3 million last year, which ranked eighth among 2013 releases.